Ray Martin would go on to make many fine space age sets, including several of my all-time favorites "Spy music" albums: Goldfinger And Other Music From James Bond Thrillers and Thunderbolt And Other Thriller Music. 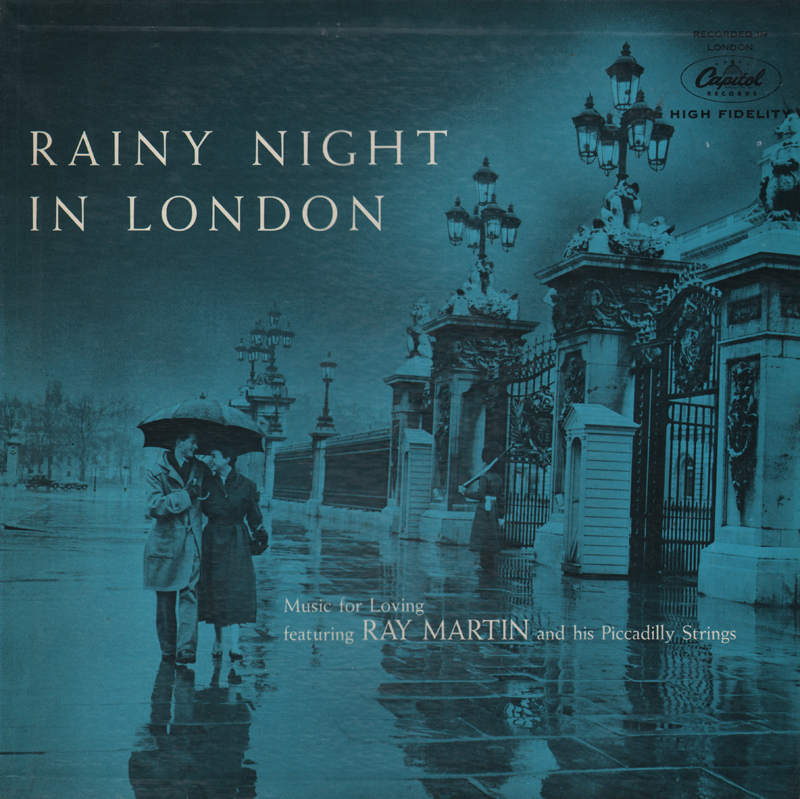 From the back cover: Making his debut in North America as a record artist with "Rainy Night In London" and his famed Piccadilly Strings, the sensitive Ray Martin needs no vocalists to provide sensual, romantic music patterns. 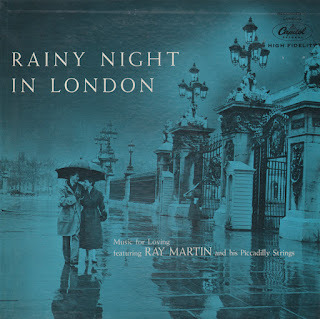 Ray has selected his favorite tunes, all of them familiar in the U.S.A. and Canada, and produced a debut album which almost certainly will establish him as a favorite maestro here, just as he is throughout the United Kingdom. A violinist and arranger as well as a gifted conductor, wine connoisseur and racer of Jaguars, young Maestro Martin served with British Intelligence Corps for four years wearing sergeant's stripes and speaking fluent French and German. 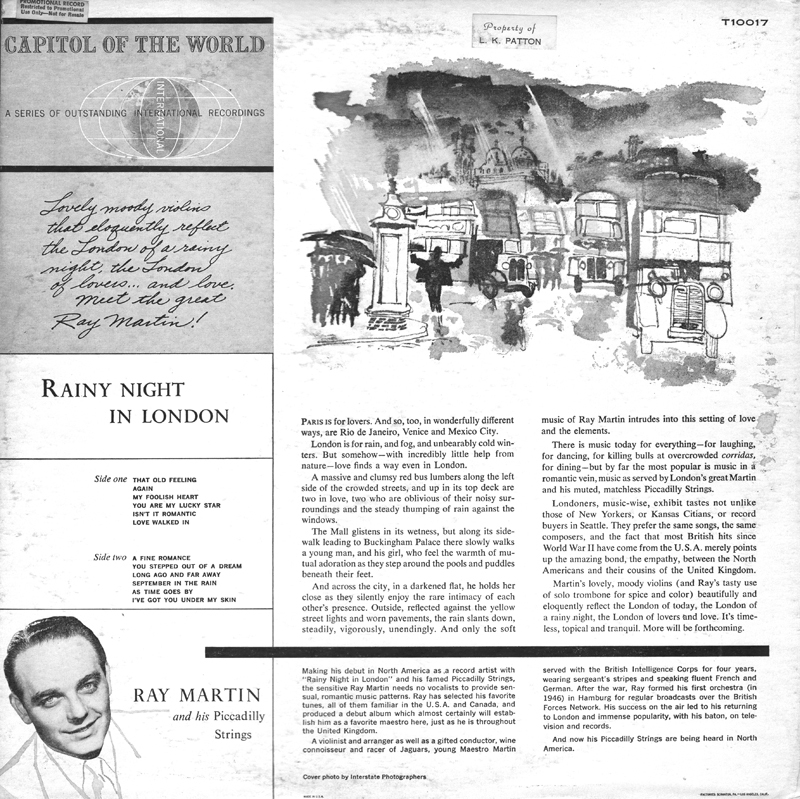 After the war, Ray formed his first orchestra (in 1946) in Hamburg for regular broadcasts over the British Forces Network. 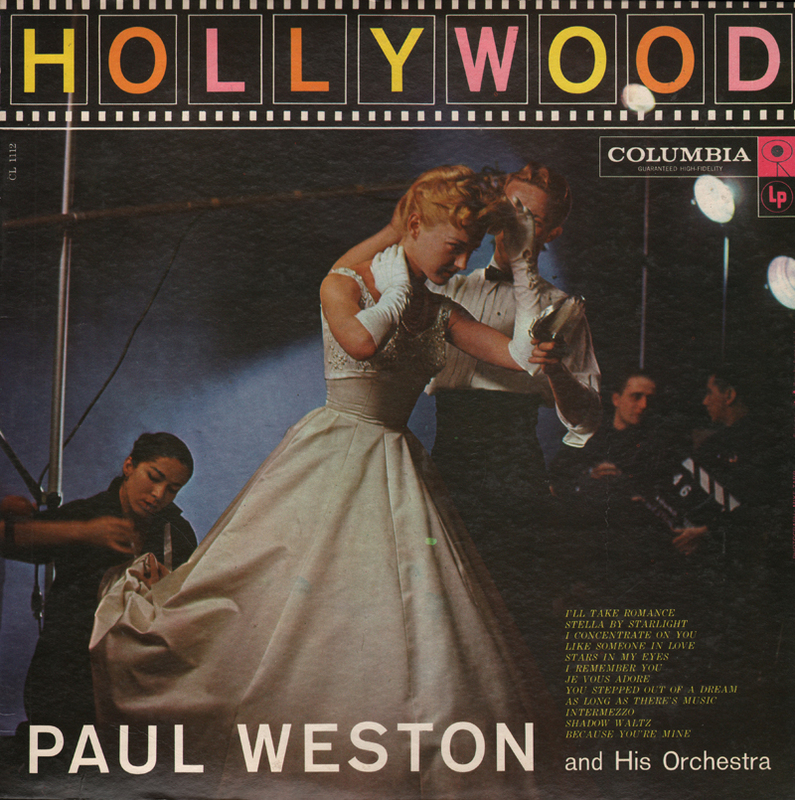 His success on the air led to his returning to London and immense popularity, with his baton, on television and records. 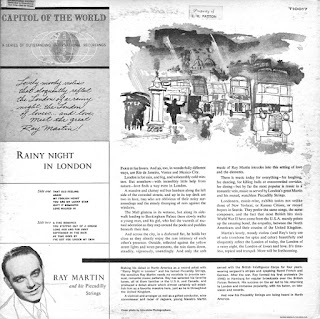 From Billboard - September 1, 1956: "Capitol of the World" package packs plenty of mood charm for ear filling, relaxed listening. All dozen selections are old fave, American love ballads which lend themselves delightfully to Martin's string treatment. Beautiful material for late night dee-jay shows. Excellent cover art. 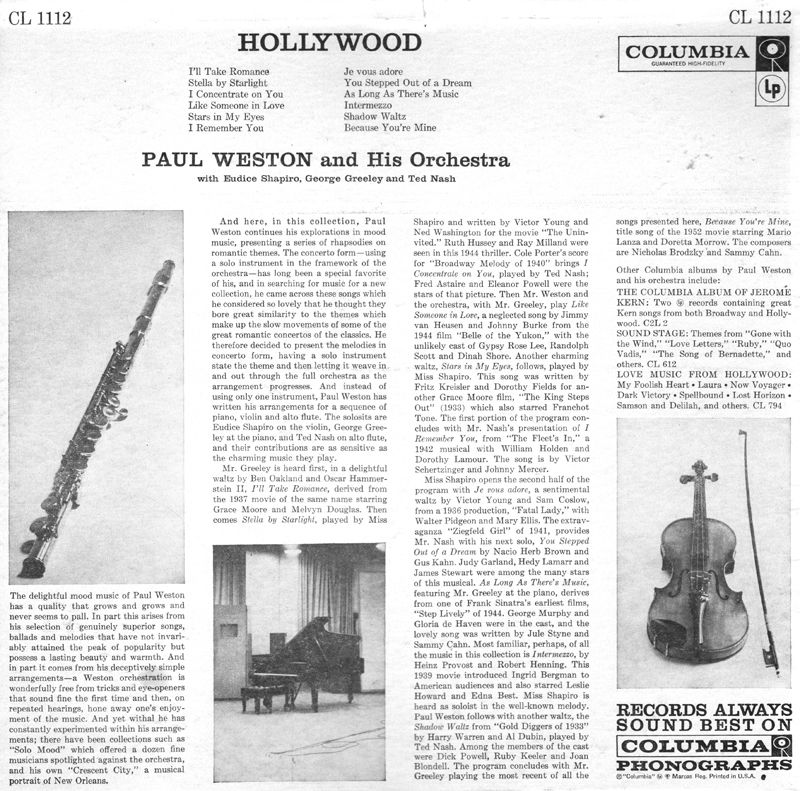 This is a nicely presented romantic mood set made special by flute, piano and violin solo work. From Billboard - April 21, 1958: Weston provides another sock package of lush, listenable mood music - a solid item for jocks. Selections - spotlighting tasteful solo work by violinist Eudice Shapiro, pianist George Greeley, and alto flutist Ted Nash - include such memorable movie themes as "Stars In My Eyes," "Shadow Waltz," and "Intermezzo.